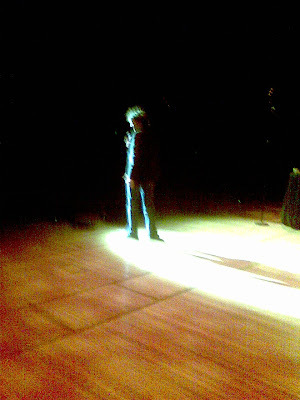 Dylan Moran in his one and only show in the Concert Hall. Setting the levels for a simple design using one follow spot and 9 lights plotted into a slow colour change over his 2 hour stand-up performance. He was very true to his Black Books character, grumpy and garrulous in that wonderful Irish brogue. He told the audience off for laughing at him, for clapping, for photographing him and for bothering to come at all. A wine (or two) at Interval made the second half flow much more assuredly than the first and the entire show was very funny and true to form. Love this photo, Katie. I also like the glimpses you give into the 'other side' of the performance. Thanks.